Overall, voters remain divided over whether life for people like them in the country today is better or worse compared with 50 years ago: 36% say that life today is better for people like them, 47% say it is worse and 13% say it is about the same. But these perceptions are starkly different among supporters of the two major party candidates: About eight-in-ten (81%) Trump backers say that things have gotten worse for people like them compared with 50 years ago. Just 19% of Clinton supporters say the same. A 59% majority of Clinton supporters say life is better for people like them; only 11% of Trump voters think this. As was the case earlier this year, there are significant demographic differences in these views. 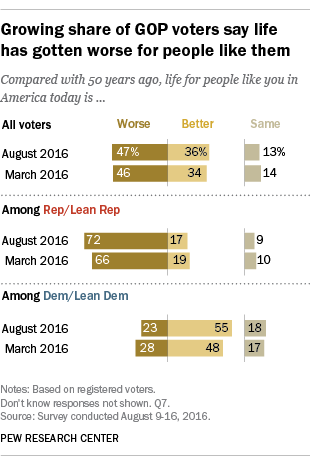 About half (51%) of black voters say life is better today for people like them and just 20% say it is worse (23% say it is about the same). By contrast, white voters are more likely to say life has gotten worse (52%) than say it has gotten better (33%); 12% say it is little different. Hispanics are divided on this question: 4o% say life is better for people like them than it was a half-century ago, while about as many (39%) say it is worse (17% say it is about the same). And better-educated voters continue to be more likely than those with less education to say life in this country for people like them has improved: 45% of those with a college degree say life is better today, 36% say it is worse and 14% say it is about the same. Among those with less education, roughly half (53%) say life today is worse for people like them, while 32% say it is better (13% say it is about the same). Overall, voters’ opinions on this question are little changed since March, but a wide partisan divide has grown wider: In March, 66% of Republican and Republican-leaning voters said that life was better for people like them 50 years ago; today, 72% express this view. At the same time, Democrats’ assessments have become more positive: In March, 48% of Democratic and Democratic-leaning voters thought that life is better today compared with 50 years ago; currently 55% say this. Will the future of the next generation be better or worse? When asked about the next generation of Americans, 49% of registered voters say the future will be worse compared with life today. Just a quarter (24%) say that life for the next generation will be better, while 22% say things will be about the same. Clinton supporters are roughly evenly divided on this question: 38% say things will be better for the next generation, 30% say they will be worse, while 28% say they will be about the same. Trump backers overwhelmingly say life for the next generation will be worse: 68% say this, while just 11% say it will be better and 15% say it will be about the same. Views of the future also differ across demographic groups: While 52% of white voters say the future of the next generation will be worse than today and just 22% say it will be better (20% say it will be the same), black and Hispanic voters are somewhat less pessimistic. About four-in-ten of those in each group say life will be worse for the next generation. Voters with a college degree are also somewhat less negative about the future: 27% say life will be better for the next generation while 44% say it will be worse. By comparison, 52% of those with less education say things will be worse for the next generation. There are no significant age differences in views on this question. Overall, 33% of voters both say that life today is worse for people like them compared with 50 years ago and that life for future generations will be worse than today. A majority of Trump supporters (58%) hold this combination of views, compared with just 12% of Clinton backers. Conversely, Clinton supporters are far more likely than Trump supporters to say that things are both better today than 50 years ago and that they will be even better for future generations (31%, compared with just 2% of Trump supporters). 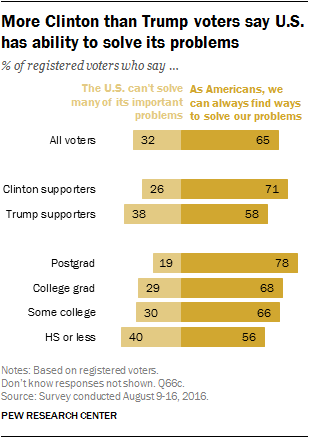 Nearly two-thirds (65%) of voters say that “as Americans, we can always find ways to solve our problems and get what we want,” while just 32% say that “the country can’t solve many of its important problems.” Majorities of both Clinton supporters and Trump supporters have an optimistic view of the nation’s ability to solve its problems, but that view is more prevalent among Clinton backers (71% vs. 58% of Trump supporters). Those with higher levels of education are the most positive in their assessments of the nation’s ability to solve its problems: 78% of those with postgraduate degrees say this. By comparison, a narrower majority (56%) of those with no college experience say the same. How has increasing diversity impacted the country? Overall, 57% of registered voters say an increasing number of people of many different races, ethnic groups and nationalities in the U.S. makes the country a better place to live, while just 8% say increasing diversity makes the country a worse place to live; 34% say it doesn’t make much difference either way. Among Clinton supporters, 72% think increasing diversity makes the U.S. a better place to live compared with only 2% who say it makes the U.S. a worse place to live. About a quarter (26%) say greater diversity doesn’t make much difference for life in the U.S.
About as many Trump supporters say greater diversity doesn’t make much difference for life in the U.S. (43%) as say it makes the U.S. a better place to live (40%); 16% of Trump supporters say an increasing number of people of many different races, ethnic groups and nationalities makes the U.S. a worse place to live. Across levels of educational attainment, those with no more than a high school diploma are the least likely to say increasing diversity makes the U.S. a better place to live. About four-in-ten (42%) of those with no more than a high school diploma say greater diversity makes the country a better place compared with majorities of those with some college experience (59%), college graduates (66%) and postgraduates (76%). When it comes to the federal government’s efforts to prevent terrorism, 64% of voters say Muslims living in the U.S. should not be subject to additional scrutiny solely because of their religion; far fewer (30%) say U.S. Muslims should receive more scrutiny than people in other religious groups. By an overwhelming margin (82%-14%), Clinton supporters say the government should not give more scrutiny to Muslims in the U.S. solely because of their religion. By contrast, most Trump supporters (57%) say Muslims living in the U.S. should be subject to more scrutiny than people in other religions groups; 37% of Trump supporters say they should not be. Among Trump supporters, 63% of those who think he would be a great or good president say U.S. Muslims should receive additional security scrutiny, while 30% say they should not. Among Trump supporters who say he would be an average or worse president, 52% oppose additional federal scrutiny for U.S. Muslims, while 43% say they should be subject to more scrutiny.